Perfectly clear skies at sunrise today - still fairly comfortable with some cool spots along the Rillito. Plot of detected CG flashes for yesterday (above from Atmo and Vaisala for 24-hours ending at 11:00 pm MST last night) indicates a very suppressed day, even with the increase in PW to values just above 30 mm. 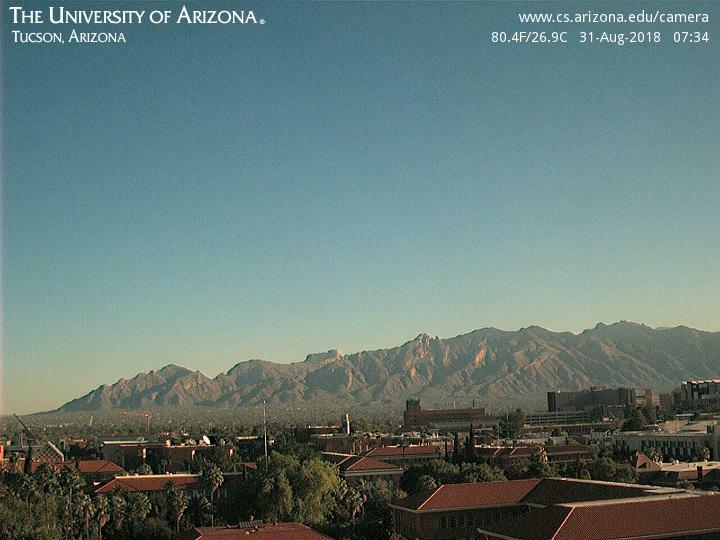 The most activity was way off east over the Chiricahuas. Morning skew-T plot for TWC upper-air data (above - from SPC, as are two analyses below) shows a very strange vertical wind profile and thermodynamics that appear to indicate considerable subsidence above 500 mb, with a nasty warm inversion up there. My subjective estimate of CAPE for late afternoon is for a sliver at best. The 500 mb chart for 12 UTC (above) shows that the advancing trough in westerlies has nudged the anticyclone all the way east to Oklahoma/Texas. The 250 mb streamlines (below) help explain the upper-level winds at TWC, as quite strong west winds approach (note the 90 kt jet over central California). It appears that the trough is coming into the west considerably stronger than the models have been predicting, which is not good for our chances for storms and rain over the long weekend. The early WRF forecasts for today keep southeast Arizona quite suppressed. The 06 UTC WRF-NAM is most active for tomorrow, although it still keeps most storm activity to our north and east. The above sounding forecast (from that run for TWC) indicates that west winds dominate, while warm middle level air continues with its nasty inversion. I again estimate just a sliver of CAPE for this sounding with considerable capping above. The forecast from that model run for total precipitation through midnight tomorrow night (below) keeps most activity along the eastern quarter of Arizona. So it goes. Yesterday's 06 UTC WRF-GFS forecast of a large outflow pushing higher PWs into southern Arizona by midnight last night was very good. This morning there is a large band of sprinkle showers moving northward across portions of southern Arizona, including the metro area. 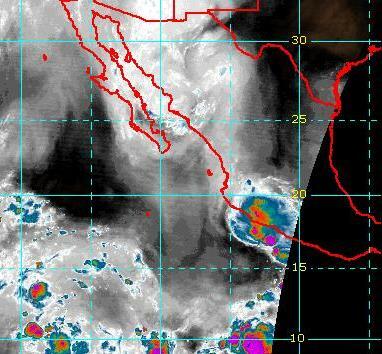 IR satellite image from 03 UTC last evening above captures the very large MCS over northern Mexico. 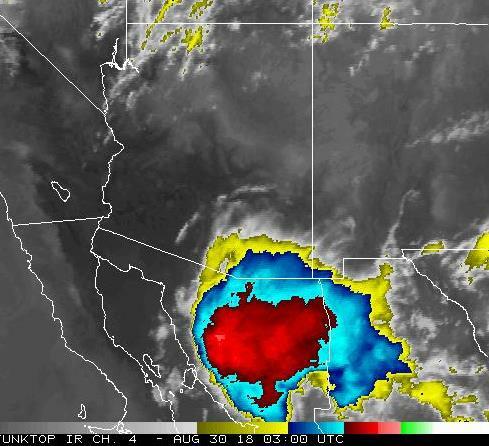 This MCS generated the large outflow that impacted much of southern Arizona during the night. Plot of detected CG flashes (from Atmo and Vaisala for 12-hours ending at midnight last night - below) indicates that a few thunderstorms inched northward into Arizona. A number of stations recorded gusts over 40 mph and a bit of rain and sharp jumps in surface dewpoint - at the airport the jump was significant around 9:00 pm MST. MIMIC total PW analysis at 12 UTC above indicates very high values of around 2 inches into Arizona between Nogales and Yuma - quite a change. This morning there is a large MCV spinning somewhere south to southwest of Nogales - need more visible images to locate it better. 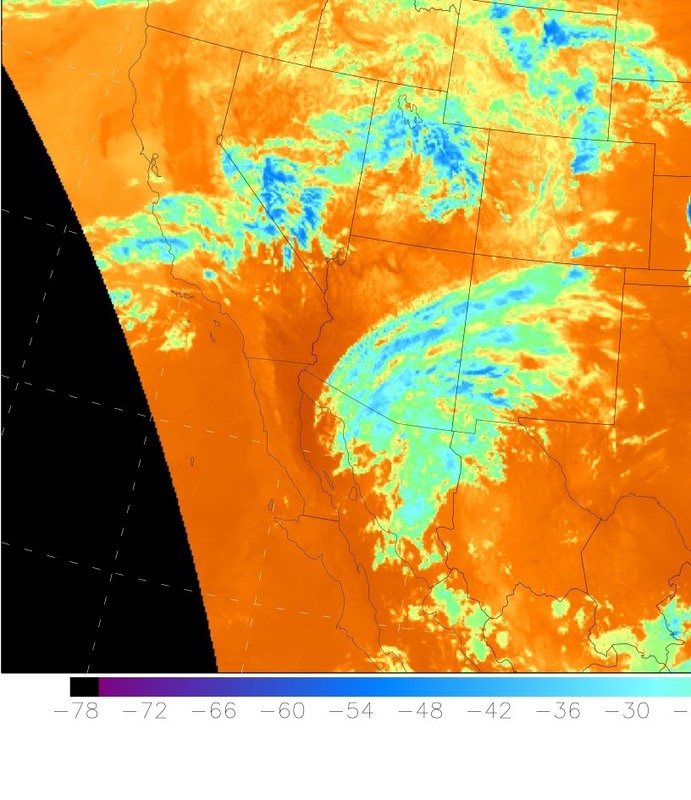 The IR image below for 1220 UTC shows a huge residual cloud mass left behind by the MCS. The 500 mb anticyclone is small but centered off toward Albuquerque, giving us strong mid-level easterlies over southeastern Arizona (12 UTC analysis above from SPC). Large trough over the northwest will be pushing on the anticyclone as it (the trough) inches southward. The 12 UTC skew-T plot for TWC (below - from SPC) has PW over an inch and a quarter with a very good wind profile for organized thunderstorms. However, with limited heating there will be little CAPE at low levels and that will have a significant capping layer above it. The current WRF forecast runs have mostly isolated mountain storms for late afternoon - which seems reasonable to me. It was the coolest morning here in a number of weeks and was much more pleasant for walking at sunrise. 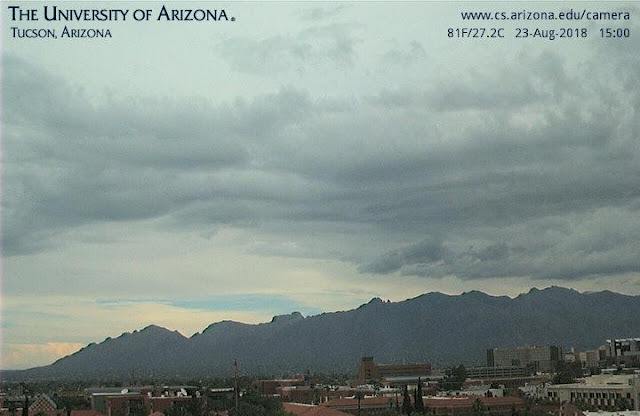 Low here was 67 F, while airport was warmer at 74 F.
High PW air is lurking just south of 30 degrees N this morning, and widespread thunderstorm activity over Sonora is likely to push the moisture back into Arizona. The plot of detected CG flashes (above from Atmo and Vaisala) is for 12-hours ending at 1:00 am MST this morning. The WRF models from last night forecast storms this evening and tonight as far north as the Borderlands out into western Pima County. The forecast below (from 06 UTC WRF-GFS) is for PW valid at midnight tonight - a large outflow from the northern Sonora storms acts to bring a significant return of higher PW air into much of southern Arizona. 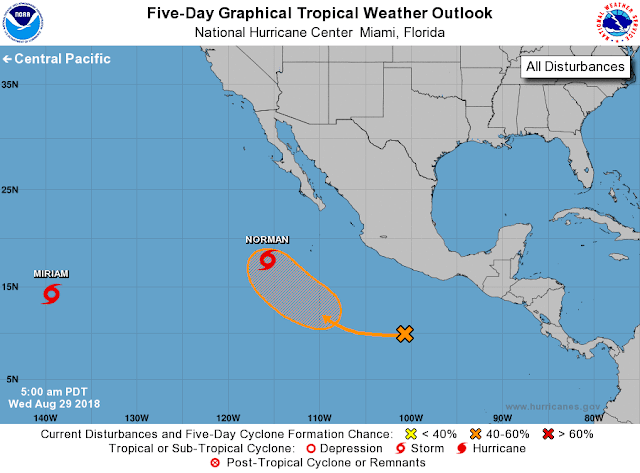 The eastern Pacific tropics are also very active (MIMIC total PW analysis above for 6:00 am this morning) - the three storms lined up west-to-east near 20 N are: remnants of Hurricane Lane; TS Miriam; and TS Norman. There is already another disturbance southeast of Norman near 100 W. Norman is forecast to become a hurricane as it heads generally westward (morning outlook for next five days below from NHC). The trailing disturbance is forecast to become a hurricane (by ECMWF but is not even captured yet in GEFS forecasts), and to perhaps track nearer to Baja. The Labor Day weekend is already beginning to look more interesting! 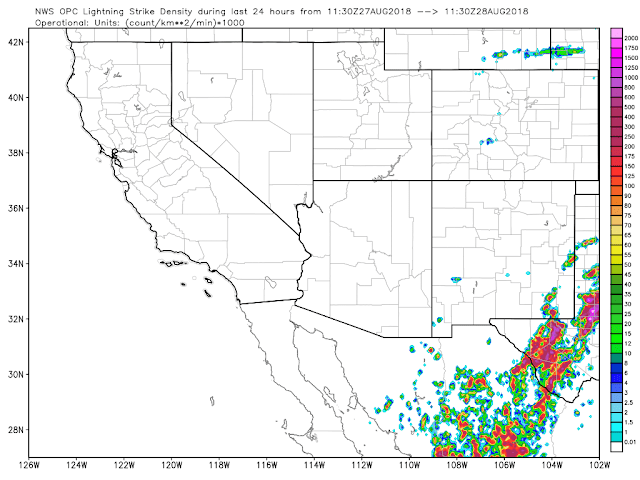 Lightning CG flash density plot above for past 24-hours (from weather.graphics and Vaisala) shows that almost the entire Southwest, west of the Front Ranges of Rockies, has been totally suppressed. The 2-day time series of GPS PW, from on campus (below), indicates that values dropped from well above 40 mm to around 20 mm this morning. How long will it last? Long-range global models are not consistent at this time - the ECMWF basically keeps us in a transition pattern through next seven or so days, while the GEFS indicates that monsoon wind patterns and some moisture may return by end of the week. So right now it's a bit of a coin toss for Labor Day weekend. Weather cartoon at bottom from David Fitzsimmons, in his book about his past 30 years of cartooning at the Arizona Daily Star. 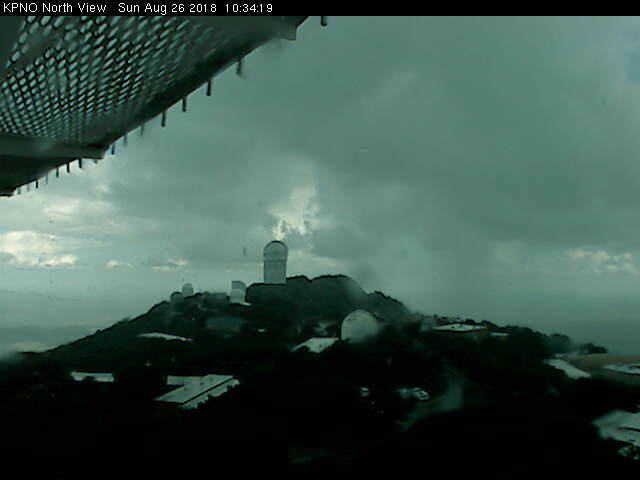 Storms developed on mountains before noon yesterday - Kitt Peak above about 10:30 am MST - building hopes for more active day. However, there was little activity during afternoon as per plot of CG flashes (from Atmo and Vaisala) below for 24-hours ending at midnight last night. Evening sounding showed that the well-mixed BL in moisture was quite shallow and not very supportive of deep convection. The dry-out is underway now and we can expect a quiet and hot week. The forecast above is of PW (from 06 UTC WRF-NAM run) and is valid at midnight tonight - it's been quite some time since we've had values so low. 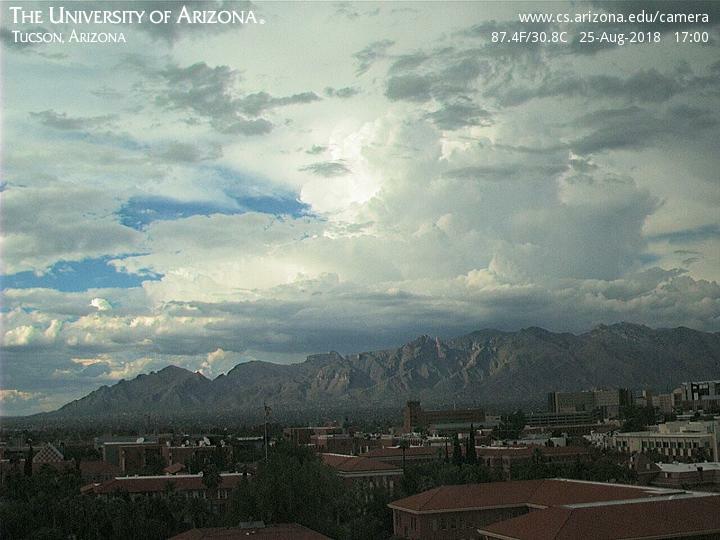 View from campus at 5:00 pm MST shows storm over Catalinas. Plot of detected CGs (below from Atmo and Vaisala is for 24-hours through 1:00 am this morning) shows thunderstorms stayed mostly on mountains, with only a couple of cells trying to move north into metro area. 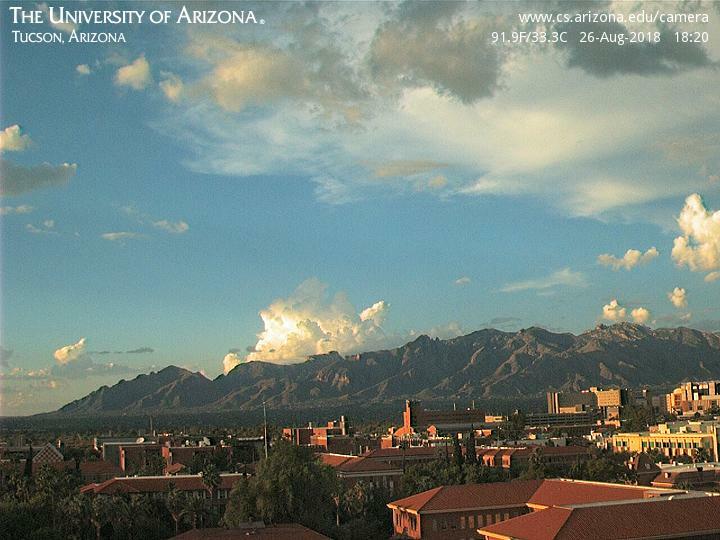 There were storms far to west yesterday also, as trough aloft was edging closer to Arizona. ALERT map second below (for 24-hours ending at 7:00 am) shows rainfall reports mainly in mountains, with several sites south of airport reporting some rain. The morning sounding at TWC (skew-T above from SPC, as is 250 mb analysis below) has considerably more potential CAPE than did yesterday's. If well-mixed afternoon BL builds to above 800 mb, there will be potential for storms at lower elevations today. Light and variable winds continue below 500 mb, but with stronger winds above. Steering winds should be from 500 to 300 mb, which would move storms to northeast. The 250 mb analysis shows that this is clearly a transition pattern, as we are now withing the leading portion of the western, upper-tropospheric trough. The strong jet winds impinging into Northwest will continue the advance of the trough and bring a big dry-out during next couple of days. Thunderstorms developed over the metro area just before dark yesterday - movement of cells was a bit erratic due to light steering winds (at one time I noticed on radar loops that strong cells were propagating toward house from both east and west). The ALERT rainfall maps - above and below - are for the 24-hours ending at 5:00 am MST this morning. There were many reports of amounts between a half and two inches. Every ALERT site - except for 9 stations - recorded rainfall. Kudos to the morning NWS forecast of 70% POPS - the highest I recall seeing this summer at 6 to 12 hours before any rain was falling. The early afternoon update did reduce the POPS down to 50% - regardless a good storm day. Reports from other local sites: TUS had 0.98" with gusts to 46 mph; DM had 0.30" with gusts to 44; here we had 0.61" with gusts estimated at least to 50 mph; Atmo measured 0.75" (see their time series of T and Td below with its very impressive drop in T); and Phoenix had yet another rain event at 0.42". Here at the house rainfall has totaled 2.16" for the seven days from last Saturday through yesterday. This was wettest seven days here in a long time. What will today bring? Given the large area of wet soils, temperatures will be cooler, and usual scenario for day like this is for little storm activity away from mountains. At 500 mb this morning (above from SPC), the weak IT has shifted a bit westward and can still be seen in wind field from southern GoC, extending northward to about the Silver City, New Mexico, area. The cyclone/IT that was pronounced yesterday am at 250 mb sheared apart into two pieces - the northern portion essentially dissipated, while there remains an IT from lower GoC extending southward. The skew-T plot for TWC's morning upper-air data (below, also from SPC) continues moist and with high potential CAPE - however, the SPC analyses estimate CAPE considerably too high, given the onion character of the profiles, and with the significant cooling below 850 mb. The winds remain L/V below 300 mb, while upper-levels westerlies are increasing due to the trough over the Northwest. Interestingly, observations at about 4:00 am this morning (i.e., approximate release time of the upper-air balloon flight) indicate that both the airport and Atmo had lower temperatures and dewpoints than were measured at the NWS release site - roof of a three story building. This difference affects strongly the surface-based CAPE calculation shown on SPC analysis. I took a look at the two 06 UTC and 12 UTC RR runs of the WRF model. Neither the NAM or GFS versions were able to forecast the low level cooling that was observed in the sounding. However the RR version started with an accurate vertical thermodynamic structure. That version of model forecasts only some isolated mountain storms - mostly to the south of the metro in Santa Cruz County, with a quiet day at low elevations. Finally, as the trough over northwest presses more toward the south, conditions here dry out considerably. Down at bottom is 06 UTC GEFS plumes for PW at TUS - PW drops below an inch Monday morning and stays there for rest of the month. A dramatic change from past weeks heads our way. Heavy cloud cover and morning storm activity kept high temperatures down 5 - 10 F yesterday, storms stayed on mountains and intensified to south also. 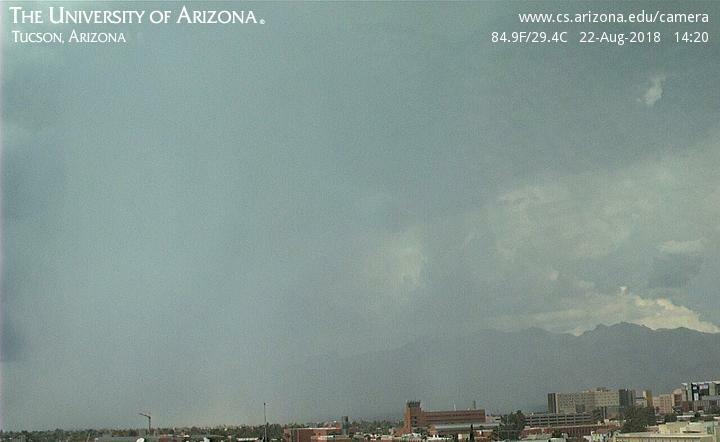 View above at 3:00 pm MST yesterday and ALERT below rainfall through 7:00 am this morning. Second below shows CGs (from Atmo and Vaisala) for 24-hours ending at 1:30 am this morning. Phoenix area turned active yesterday, with more severe storms and wind reports - but note the Tucson donut hole. 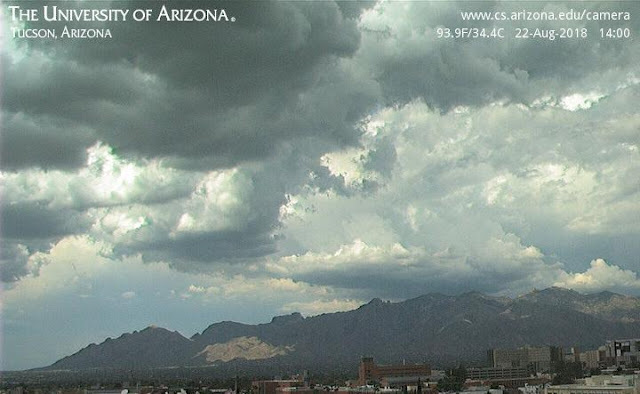 Heavy storms developed during morning south of here - Elephant Head 0.51"; Tubac 0.87"; and Nogales 0.95". 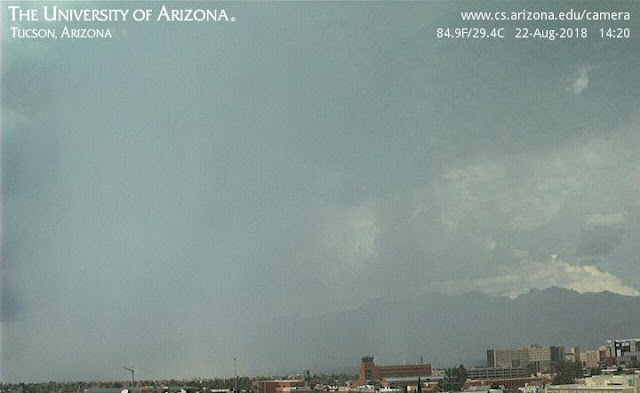 The Nogales ASOS is at the "International" airport several miles east-northeast of the city, where much heavier rains and serious flash flooding occurred at mid-morning. The TWC morning sounding above (from SPC) remains little changed very tropical and moist with considerable CAPE. East winds remain light but layer is deeper, so a bit more steering flow possible today. The visible satellite image below, from 7:00 am, shows that most of southeastern Arizona remains under the clouds - will there be breaks in this that allow better heating? Above is morning 500 mb analysis and down at bottom is that for 250 mb (both from SPC). Little has changed at 500 since yesterday morning - weak inverted trough remains from southern GoC north into central New Mexico. Another key question for today is whether this feature will move toward the west. The 250 mb/upper-tropospheric cyclone/inverted trough has moved westward and appears to be centered south of El Paso and west of the Big Bend of the Rio Grande - as per 1330 UTC water vapor image below (and loops of same) and also 250 data at bottom. The various WRF models forecast the upper feature to begin nudging the mid-level IT westward, and locate it over eastern Pima Count by late afternoon. All three versions I looked at forecast an active storm day for us, with 12 UTC WRFRR forecast really pounding the metro area, but model forecasts clouds to break by noon and temperatures around metro to go into 90s (vs middle 80s yesterday). Watch for clearing skies. Heavy storms developed over parts of metro area during early afternoon yesterday. The view of Catalinas from campus (above and below) captured the very rapid storm formation near and west of the mountains in only 20 minutes. The ALERT rainfall map (above for 24-hours ending at 7:00 am MST this morning) again shows a hit-and-miss pattern over the network. The very heavy storms over northwest metro produced rain amounts to over 3", damaging wet downbursts, and local flash flooding. Ron Holle reported over an inch and half in a short period yesterday afternoon, while here at house we had an extreme downpour that produced 0.69" in about 10 minutes (another storm around 2:00 am this morning added 0.14" for total 24-hour rain of 0.83". In contrast: Atmo had 0.11"; TUS 0.09"; and DM a Trace (also 24-hour amounts). 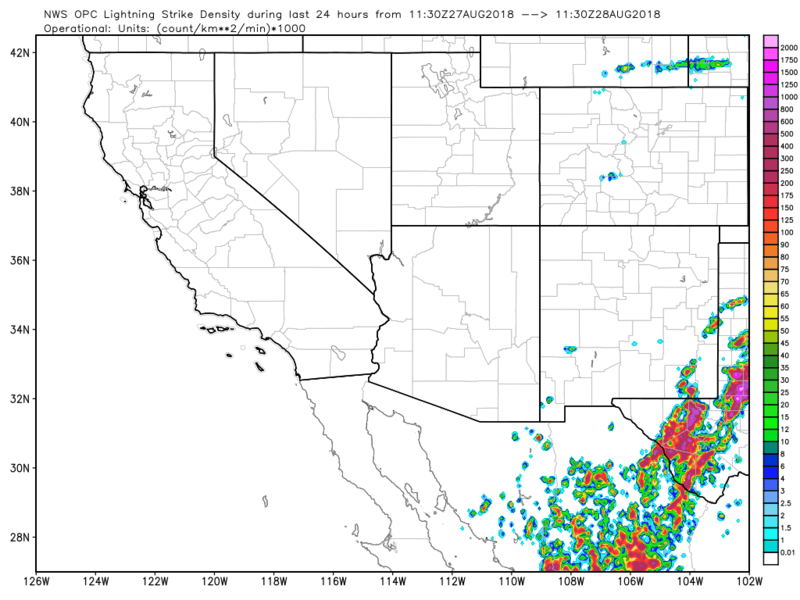 The plot of detected CG flashes (below, from Atmo and Vaisala for 24-hours ending at 7:00 am) indicates a very active day for much of south-central and southeast Arizona - but with large donut hole centered on Phoenix area. At 500 mb (both of these 12 UTC charts from SPC) the cyclone over the northwest has weakened and shifted to Montana. Of interest to us is that the north end of a weak IT over Sonora has merged with the weak trough from Montana low just to our east. This feature does not extend up to 250 mb (below), where a significant cyclone is moving westward through the southern portions of the anticyclone. Another very complicated large-scale setting. This morning's TWC 12 UTC sounding plot (above) continues very wet and with significant CAPE again present. Winds below 300 mb are very light, leaving little in way of steering winds and a continuing threat for heavy local rains and wet microbursts. However, today there is significant morning cloud cover - below is visible image from 7:30 am. Further complications are that: another MCV has been left behind by an early morning MCS - this feature is spinning in the above mentioned, merged-trough line near Douglas; and an area of thunderstorms has developed since sunrise northwest of Marana. Another interesting day likely - given a bit of local heating.